Waiting on Wednesday is a weekly meme hosted by Jill at Breaking the Spine where bloggers like me get to gush about what makes my hands all grabby. Ahh! You guys! I can't wait for this one! I absolutely loved the Hex Hall Series. The sarcasm, wit, and loads of witchy/demon stuff made for very entertaining reads. And this spinoff sounds fantastic! And I love this cover. I like how they kept the theme that they used for the Hex Hall Series. The mirroring of the girl makes for an interesting and beautiful cover. So what is everyone waiting on this fine Wednesday? I agree with what you said about the cover design! 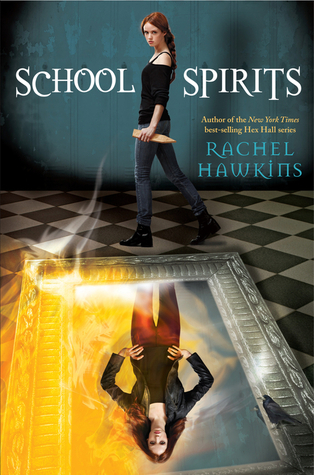 And I also can't wait for this one - I finally got my Spellbound paperback in the mail last week so I should be caught up when the spin-off comes out ^^ Great pick! I like how they kept the theme too. Usually I don't like spin offs, but I'm hoping this will be a contradiction. I've only read Hex Hall (I think?) ages ago but I remember liking it! I haven't read Hex Hall yet, but this sounds great and I'm looking forward to it, too. I have been wanting to read this series forever! I haven't gotten to it, and to be honest I was a little afraid it was more of a middle grade than a YA, and I would lose interest! Love the Hex Hall series, so I can't wait to read her new series. Great pick! I really need to read both of these series!!!! They look great, and I've heard amazing things. Love the sound of this one. I'm really excited about it. I finished the Hex Hall series a while back and I'm really looking forward to this one. Great pick! I haven't read the Hex Hall series even though I own the first book. School Spirit sounds fantastic though! YESSS! I love the Hex Hal trilogy. Cannot wait for this one!